I wouldn't have been angry if the series ended right here. There was a perfect quality to this first half of the series that immediately dissipated afterwards (even though I loved the town and characters that revealed itself later). And how cruel of an irony would it had been if even the formidable Coop would have ultimately proven ineffectual in solving the mystery of Laura's murder. Wild at Heart won the Palme D'Or at Cannes in May of 1990. 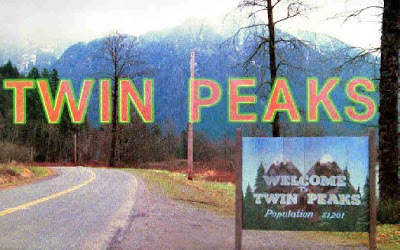 Lynch had been absent long before the 2nd half of the series started filming which would have presumably been sometime around December '90/January '91. In fact he was absent for most of the first season as well, shooting only the trippy second episode after the Pilot. I think the likely culprit of his disillusionment was what you correctly mentioned as the production heads' decision to force the climax. Lynch had always preferred that the murder never be solved providing an excuse for Coop to be marooned there and allowing us to get to know the town's denizens a bit better. And honestly, Lynch has admitted he wasn't up to the daily grind of mediocrity that was so pervasive in network TV at the time. So true. In fact, this can be applied to most of Lynch's work. I've always told people seeking to understand LH, MD, or IE that they shouldn't overthink it. Sleeping on it usually provides more answers, the same way that usually helps one in resolving the coded symbols of a dream. Lynch is the rare artist that seems to connect to something in the dream consciousness and is able to bring it to terrible life. ...one reason why I always greet a Lynch viewing with both excitement and trepidation. Amen, brother. And its only getting harder now that he's fully tuned into his subconscious with the TM he's practicing. TP:FWWM seems to be a transitional movie into a more abstract surreal style that seems free of the overt symbolism in Eraserhead and Dune, some of his earlier more abstract works. I think if TP:FWWM hadn't been so loaded with expectations at the time of its original release it would have fared better critically. A lot of folks have been revisiting that one of late. Hey I like your insight. On point as usual. Death to those who would tie Lynch's symbols down to one particular meaning, rather than taking them and going the other direction. I didn't know it was Lynch season for you guys. You have grown in number? Can I play too? I tied Lynch into my discussion of THE STORY OF TEMPLE DRAKE over on my acidemic blog. You link? Erich- Sounds good. Glad to see you around the site! We have grown quite a bit...five writers now and hits keep going up. Woo hoo! I still very much enjoy Acidemic and your insights. Can I just repost your article here? Or would you rather me just do a links page for Lynch week? I can certainly do either, as so many have written on Lynch. Perhaps I'll do a big Lynch links for the end of the week tomorrow. If any of ya'll regulars want me to link, drop a line here or send an email to the Out 1 account. (Address is on the top right of the page, under the poll, as you've probably seen). http://www.brightlightsfilm.com/62/62bookslynch.html... okay, now I'll stop. Haha. Looks great, Erich. Thanks for the links. I love(d) the Bright Lights review. Great stuff, per usual. Tony D. - I too would've been very pleased if the series had ended after episode 14. Alas . . . And yeah, I know Lynch was absent before, but I think WILD AT HEART gave him a really good out and certainly distracted him from the show, particularly at the time that the post-murderer reveal episodes were being conceptualized and scripted. I'm actually a pretty big fan of TP:FWWM, so I'm certainly with you in asserting that it deserves a massive critical reevaluation - one that is already underway. Erich - Thanks for the comment! Good to see you getting in on the Lynch-loving action. I didn't express it clearly enough, Brandon. What I meant to say was that Wild at Heart had little impact on the second half of the series. The film was complete and shown in Cannes by May of '90, and he did press for it all summer long culminating in its US release in August of '90. The film maybe played for a month 1/2 in Miami, where I lived at the time. Now I was wrong about when the second half began production so let me retract that. I didn't realize ep. #15 aired on 11/17. But even with that, and taking into account a typical six week turnaround time from production to air, it would have been filmed in September. So I think that the only impact Lynch's involvement with Wild at Heart would have had on TP's 2nd half would be due to the tail end of its publicity tour, and perhaps its overseas' releases. As for Lynch, I think editing is a crucial part of his process - that's where, if anywhere, he "makes sense" of what he's dredged up for the unconscious. 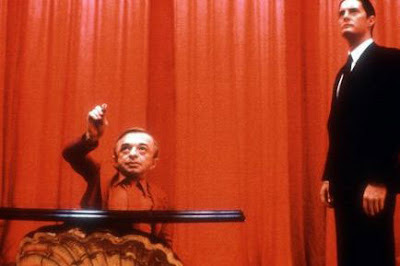 This is obvious from Fire Walk With Me on - where little hints of other plotlines emerge, wisps of what was cut down from hours and hours of footage, where storylines are sculpted from material which was not conceived within any narrative arc. But apparently it was even true, in its own way, as far back as Blue Velvet - though there the process was more of a streamlining than anything else: originally, the ear was discovered many scenes into the movie, instead of after about 8 minutes and a couple lines from MacLachlan. Goddamn it, MM, it's great to hear you say that. Down with rationalism! I didn't know that about Lynch with editing. That's how I make my movies too! I HATE those damned rationalist Godard "scholars." We should all collaborate on an essay collection that takes a stand against all this fusty drab Godard intepreting that chokes the life out of his hyper-active wistful poetry, as you call it. and instead champions the talking about fire with fire approach. Wild at Heart though, I still can't into that movie. I can watch it a hundred times, and i have, and yet I still don't like it. That's Lynch for you though. It's gotta be brilliant eventually...with Lynch, everything is. Erich, we are definitely simpatico on Godard. Another thing that irritates me about film-culture discussions of Godard is the focus on his early 60s films which are, to me, by and large the least interesting (my favorite of these may be Le Petit Soldat, which is also the most underrated of them). I think his work really finds its stride in the mid-60s - my favorites being Alphaville, Band of Outsiders, La Chinoise, and especially Masculin Feminin, which also sometimes moonlights as my favorite film of all time (incongrously sitting alongside Lawrence of Arabia, Vertigo, The Godfather, and - somewhat more fittingly, given the stylistic fireworks - Easy Rider). This is not a controversial opinion among Godard-lovers but with those who are lukewarm on the man but feel they have to throw him a bone, Breathless is always the obligatory mention with inordinate focus on the jump cuts, not one of Godard's typical devices, nor an especially fantastic one as Godard devices go. And I was not very impressed by Wild at Heart. Among other things, it's too self-satisfied, just like Cage's character (though it's a lot smarter than he is). Excellent call on how Agent Cooper's intuitive -- as opposed to rational -- approach to detective work should inform the way we look at all of Lynch's work. This made me think of Dario Argento because a lot of his movies ascribe to a sort of dream logic. You could draw parallel between Agent Cooper's style of investigation and the course of the detective work done in Deep Red or Tenebrae.